NEW YORK, New York, December 7, 2018 (ENS) – The Trump administration has decided to authorize the use of seismic air guns to locate oil and gas pockets deep beneath the Atlantic Ocean floor, reversing Obama administration policy, and drawing the ire of East Coast elected officials, marine scientists and environmentalists. A coalition of major public aquariums announced today that they are opposed to NOAA Fisheries’ pending issuance of five permits to allow repeated seismic blasting along the East Coast. Marine scientists fear that the prolonged and extreme noise pollution introduced into already highly stressed ocean environments will disturb marine life from tiny plankton to commercially valuable fish stocks and giant whales. “As the nation’s aquariums, it’s our duty to speak up in defense of our oceans. Now is not the time to move backwards,” said Vikki Spruill, president and CEO of the New England Aquarium. The Boston-based marine conservation organization has joined the National Aquarium in Baltimore, the Mystic Aquarium in Connecticut, the Virginia Aquarium and Marine Science Center, the North Carolina Aquariums and the New York Aquarium with its parent Wildlife Conservation Society in opposition to NOAA Fisheries’ recent approval of the sound blasting program from Delaware to Florida. “We strongly oppose the administration’s actions along the Atlantic seaboard. We stand with the 300 municipalities and 2,000 local officials who have formally opposed offshore drilling and seismic exploration,” said Spruill. With the exception of Maine and Georgia, every governor from Florida to New Hampshire has publicly denounced the Trump administration’s proposal to allow offshore oil and gas exploration, development, and production in the U.S. Atlantic Exclusive Economic Zone, the area within 200 miles of the U.S. coastline. Yet on November 30, NOAA Fisheries gave the green light for the Bureau of Ocean Energy Management to launch a series of seismic surveys by private companies along the Atlantic coast. 2 – ION Geophysical. Headquartered in Houston, Texas, ION has offices in the United States, Canada, Latin America, Europe, Africa, Russia, China and the Middle East. It provides acquisition equipment, software, planning and seismic processing services and seismic data libraries to the global oil and gas industry. 3 – Spectrum GEO Inc., a company based in Norway with offices in Houston, Australia, Brazil, Egypt, Singapore and the UK. 4 – TGS-NOPEC Geophysical Company – Based in Houston, Texas and Norway, offers seismic and well data, processing tools, depth imaging capabilities and interpretation products and services. 5 – WesternGeco is a geophysical services company based in London, UK. 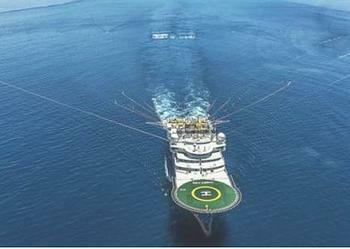 The company, a business segment of Schlumberger, offers 3D and time-lapse seismic surveys. The industry claims that the seismic surveys will have “no measurable impact on fish or marine mammal populations,” but many scientific papers show that seismic exploration harms ocean life at every level of the food chain. These surveys use airguns that are towed behind ships and shoot loud blasts of compressed air through the water and miles into the seabed, which reflect back information about buried oil and gas deposits. Airgun surveys produce intense explosions every nine to 11 seconds for many weeks or months at a time. All of this is undetectable to someone at the surface, but the underwater impact and disturbance from these activities can be devastating to ocean life. The explosions from seismic airgun blasts are 200 to 260 decibels in water – the equivalent of 140 to 200 decibels (dB) in air. By comparison, a loud rock concert is about 120dB and a jet engine at 100 feet is about 140dB. For marine mammals that depend on sound to maintain contact with calves, locate food and find mates, seismic surveys are dangerous to their most essential life functions. For the world’s most endangered large whale, the North Atlantic right whale, it will affect the most vulnerable members of the population, mothers and calves. 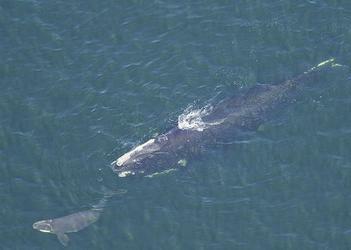 In 2018, there were no calves born in a population of just over 400 North Atlantic right whales. NOAA’s authorization of “incidental harassment” coincides with an unprecedented three open and unresolved unusual mortality events for large whale species along the U.S. East Coast. Over the past two years, humpback, minke, and right whales have all suffered much greater than normal die-offs. Despite 40 years of federal protections, the right whale population is declining due to entanglements in fishing gear, vessel strikes and underwater noise. 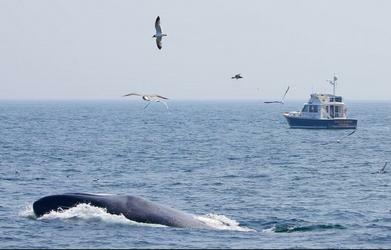 “To introduce the additional major and possibly lethal stressor of seismic blasting to already beleaguered whale populations along the Atlantic seaboard is an abdication of NOAA’s responsibility for the sound management of the living marine resources in the region,” said Scott Kraus, vice president and chief scientist for marine mammals at the New England Aquarium. A recent study shows that seismic surveys cause mortality events in zooplankton, the tiny animals upon which a healthy and productive ocean ecosystem depend. Zooplankton decline by 64 percent within 4,000 feet of seismic blasts. Because seismic surveys will take many months to complete, involving multiple vessels over the same area, there is the potential for widespread damage to ocean productivity. NOAA says it will limit seismic blasts from November to April in regions of the Atlantic where the right whales are known to migrate, and if whales are in the vicinity, blasts will not be allowed within 56 miles of an endangered animal. The aquariums say NOAA’s proposed mitigation strategy is not enough, because seismic noise travels hundreds of miles underwater. Earlier this year, Maryland Governor Larry Hogan asked the Trump administration to remove Maryland waters from possible drilling sites, and the state’s General Assembly passed a law imposing strict liability standards for any future spills from offshore drilling. Seismic exploration has been shown to reduce singing in humpback whales, displace finback whales by hundreds of miles and disrupt activities vital to foraging and reproduction over vast ocean areas. In the Pacific, recent seismic noise has been linked to significant reductions in calf survival in western Pacific gray whales, another endangered species of baleen whale. With five applications approved for seismic exploration, these surveys are loud enough to impact every aspect of the marine ecosystem off the U.S. Atlantic coast. Seismic surveys can affect commercial and recreational fishing. Where seismic surveys take place, fewer fish are caught. Studies show that landings dropped 40 to 80 percent in key economic fish species including haddock, rockfish, herring, and blue whiting, in regions near seismic surveys. “Today, the role of public aquariums expands beyond our gates. We are also research organizations and educational facilities with the responsibility to provide real and applied science to protect our oceans,” explained Katie Cubina, senior vice president for Mission Programs at the Mystic Aquarium. The aquariums are calling on the public to reach out to their government officials to prevent the seismic surveys along the U.S. East Coast. The U.S. Atlantic coast is a highly industrialized ecosystem that is already vulnerable to multiple stressors created by human activity. Critics warn that adding another major stressor could move many species beyond the tipping point into precipitous, unrecoverable declines.